I have written this article to bring across many facts about Acaras. 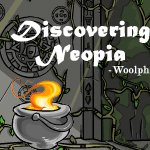 These facts haven't been read in the Neopedia, nor have they been shown to the Neopian nation. But the truth must be told. Many Acaras may not like what they are about to read. If this is the case, don’t read it. Many wonder where these delightful but devious Neocreatures come from. Some say their ears stuck out of Meridell soil waiting to be picked in the summer months. Some believe that the native acaras originated from tribes on Mystery Island years before Meridell even existed. Others believe that it should be a mystery left unsolved. You have heard of the phrase 'curiosity killed the Acara' haven't you? Well then. We approach ‘The First Acara War': also known as the 'Bonsai Beat down'. As Mystery Island grew bigger and the Acara population expanded, a shortage in pink Bonsai trees occurred. Strong winds were hitting the banks of the mystery beach and destroying many Bonsais. With the Acara population growing more Acaras were needing shelter and with the Bonsais becoming extinct, Acaras were having many problems. After trying to solve the problem they found that the problem could not be solved. At this point, many Acaras had grouped up into small gangs. Some Acaras grouped up on the North Beach and others on the south. Everything was getting worse when a tragedy bigger than before swept over them. A strong wind hit the northern beach wiping out all the Bonsai trees and leaving all the Northern Acaras homeless. The Acaras, very panicked and upset walked down to the Southern Beach to ask the other Acaras for help. Selfishly, the Acaras on the southern side refused to help them. This was the last straw for the Northern Acaras. After a few weeks of planning they decided to attack. They bombarded the Northern Acaras with coconuts. Most Northern Acaras did not survive and the few that did had no choice but to team up with the Southerners. From then on there was no separation between north and south and the Acaras lived in harmony. There were still only enough Bonsai trees to live but this was not a problem as came ‘The Immigration' a while later. At this point Acaras realised that Mystery Island wasn’t the only island. After a couple of years the Acaras immigrated to all different Islands until they gradually spread throughout all of Neoworld (eventually!). Many Acaras situated in main lands. The main lands were treasured by the Acaras because no strong winds blew in that area. It was a relief for the Acaras as many years of their life was spent scrapping over trees and fruit. After settling on different parts of Neopia the Acaras discovered the Rainbow Pool (well, the Chia was the first Neopet to discover it but anyway..). Instead of all Acaras being a dung brown colour many were painted bright red, starry, and striped. Some spent their summers tanning under the sun until they turned a dark orange colour. Most Acaras did not swim in the sea though they lay on the beach. Ashamed by their heritage; they chose to never approach water. They thought that by swimming the sea they were encouraging the barbaric Acaras to interfere with their lives. They preferred to act as if they didn’t descend from the native Acaras at all. An example of this is Princess Fernypoo. You may have heard of this royal pain of an Acara before you read this article, known for her royalty, cleanliness and fear of water (I bet that’s something you never learnt from reading the Neopedia). She would never admit that she has a connection to the natives but shows the true characteristics of one. Her wit, confidence, pride and her very fierce temper! Many Acaras carry these traits. The last place Acaras have been known to be seen is the Battledome. Most Acaras believe in peace, and not fighting for pleasure. Though this is a fact, many owners still choose to train their Acaras for this beastly sport. Acaras may not enjoy it, but they will do it for their owners. One trait that Acaras are well known for is being competitors. They thrive on winning, which is a positive in the Battledome as well as the Gamesroom, So don't be surprised if you see more of these creatures in the high score boards! NEVER be fooled by their cuteness. It is a cover of their true personalities. DON'T give in to their cute smiles. The scary part is the more they are redesigned, the cuter they get! Well then, after reading all of this I have probably got your mind churning. So to cut a long story short, watch out. You never know their next move. Taking over the Gamesroom? Killing the non-Acara population? We'll have to see… keep your eyes peeled!